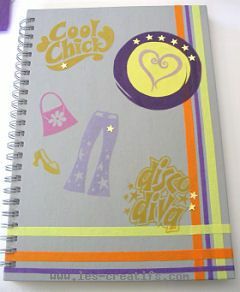 Aspiral-bound exercise book with a hard cover may be decorated all over with a little paint and a collage design. Step 1 Paint the hard cover a light gray (a mix of a little black and a lot of white) applying two coats, including to the spiral binding. Step 2 Stick strips of Rainbow tape to the right-hand and bottom borders of the book, letting them overlap so as to fold them back behind the book cover. Step 3 Decorate using the Magic Motifs. The designs are applied simply by placing them (first remove the protective film) wherever you want, then rubbing hard on the transparent film to make the design stick properly to the exercise book. Next, take off this film and rub the design with a sheet of flock/flocking fiber in the color of your choice: the fiber will remain stuck to the design, completely covering it. To accentuate the 'scrapbooking' look even more, cut out a circle in the glossy purple paper (by making a cut from one of the edges), and glue on another, smaller circle in yellow paper. Next , decorate with a Magic motif heart. Finally, add a few gold stars.